Have you ever had a BEIGNET? They're REALLY delicious. I collaborate annually with Community Coffee and each year they come out with a delicious Limited Edition coffee. Last year they made a special Saints Blend (for our NFL Football team), Pecan Praline Blend (still available) and Amber Sunrise Blend (still available) to support land preservation efforts along the Gulf Coast. The year prior they made a special King Cake Blend (still available) which is synonymous with Mardi Gras. This year, Community Coffee made a SUGAR DUSTED BEIGNET coffee blend! Their new Sugar-Dusted Beignet blend coffee is the combination of a powdered sugar-dusted french beignet with medium roasted 100% select Arabica coffee beans. It has a delightful sweet taste. I was so excited they did this, because I LOVE beignets! You may remember me eating beignets at a place called Morning Call in City Park. A really popular place to eat beignets is Cafe Du Monde! They have a number of locations throughout Louisiana! The one in the French Quarter is really popular with tourists. The Cafe Du Monde below is located in Metairie, Louisiana. It's a great place to have coffee & beignets. 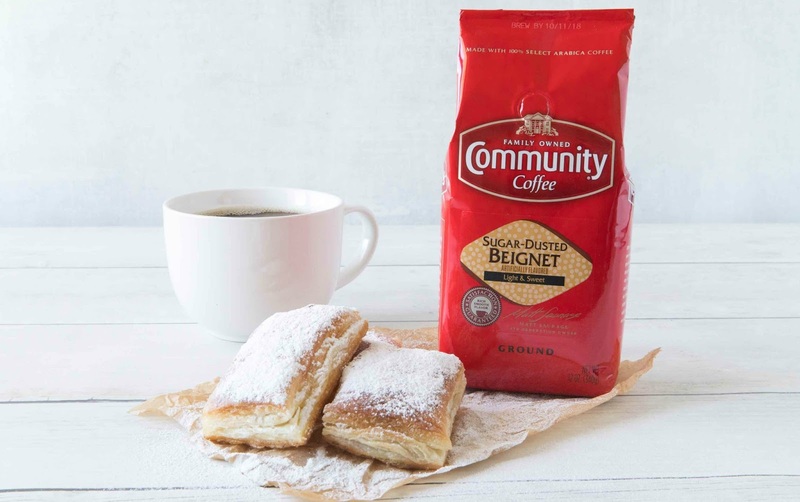 Community Coffee's Sugar-Dusted Beignet Coffee comes in ground (bag), K-cup and bulk selections $6.49 - $45.99. There's even a cute video that shows you how to make a beignet (just click on the link above). PR Sample - I was sent full size samples of Community Coffee Sugar Dusted Beignet and Breakfast Blend for review. All opinions are 100% my own. I love coffee and I would love to try this one! This looks like a great coffee blend. Beignets...I've just googled them to find out more and you know I don't think I have ever had a beignet. They sure do look yummy, though. Yum I have such a craving now! This coffee flavour sounds awesome, Kim! I've never had authentic beignets but I've seen them being made on some cooking shows and they sound/look so goooood! Anything fried is great by me....bwahaha! Oh that would be such a fun coffee flavour to try! :) I'm not a coffee drinker Kim, but as always you manage to make things look and sound so good I'd love to try, haha! Mmm I haven't had a beignet in ages but remember loving them! The flavor sounds wonderful!